I’m so excited ya’ll! I just mailed off my very first offering to a monthly craft-based subscription box, The Crafty Mail! 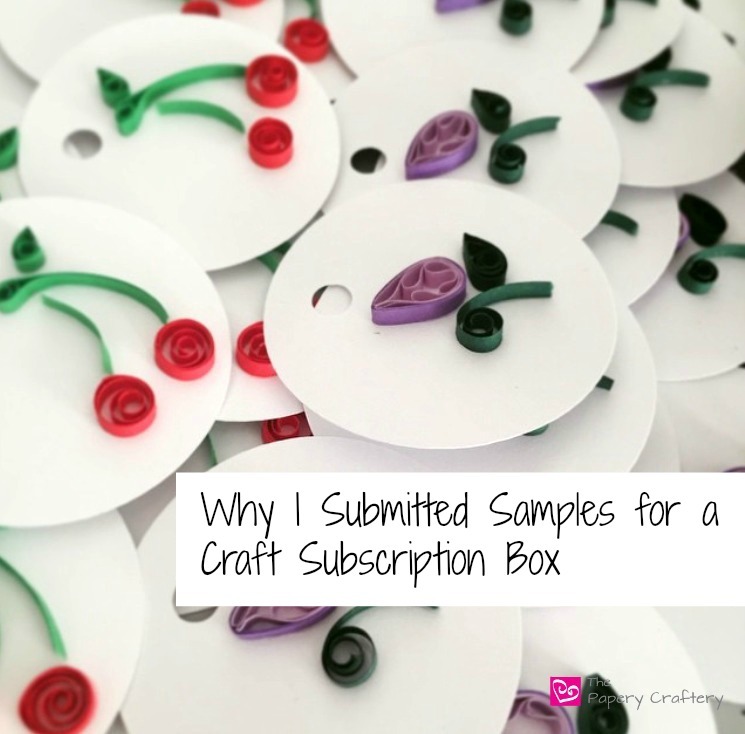 For those new on the scene, subscription boxes are curated packages that are based on a common theme, this one being made up of entirely handmade crafts. 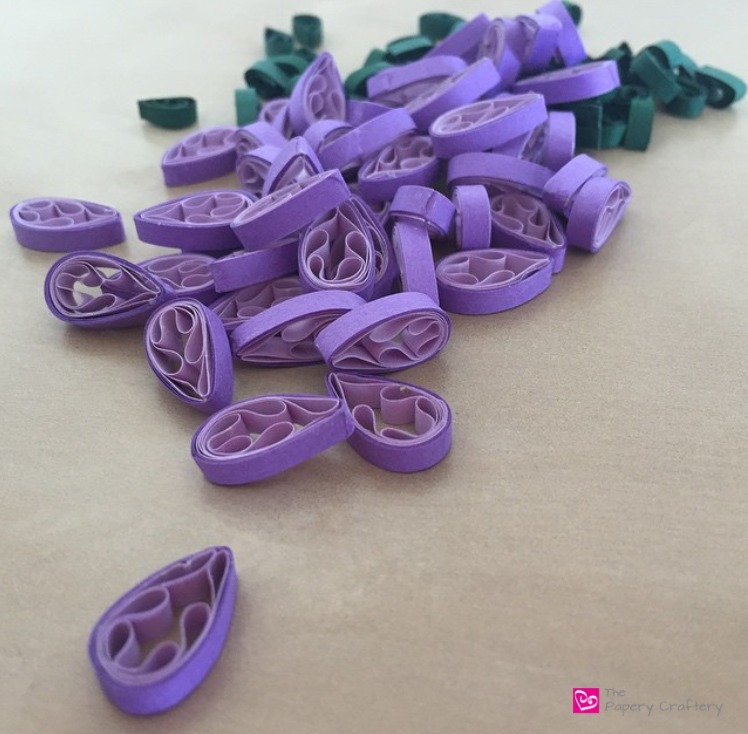 I put in a good amount of work to get my samples together, but I’m thrilled to work with this new company and this is why I submitted samples for a craft subscription box in one of their inaugural months! The exact circumstances of how I first ran across The Crafty Mail escape me now (as do many details in my life), but I know that I found them on the small business contact-making wonderland that is Instagram. After emailing with the owner of The Crafty Mail a few times, I had all the how, where, and when details that I needed to submit my contribution. I could send 50 samples and I would receive plenty of advertising and my own box filled with handcrafted goodness! But, knowing my life, I opted to commit to the second month of boxes, August, to give myself a little crafting wiggle room. I decided to create some of my handmade gift tags to send as my part. 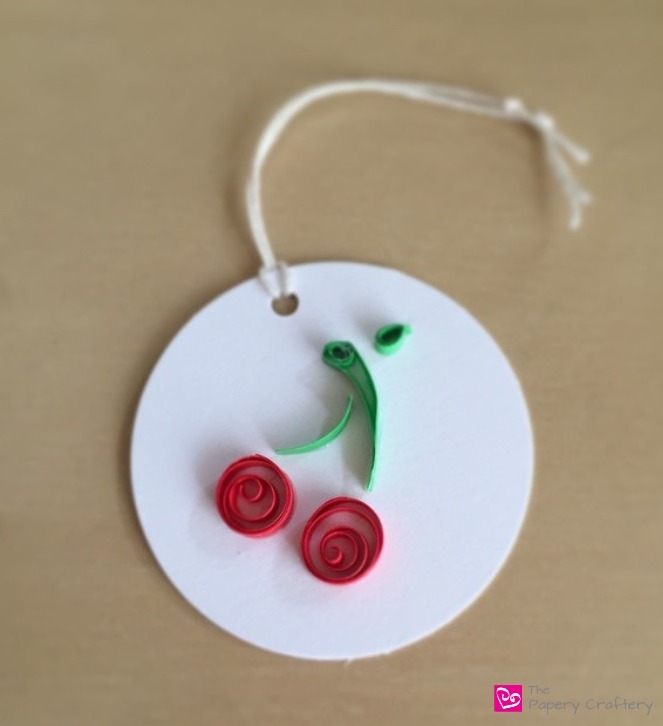 My paper quilling flower bud gift tags were a no-brainer. I knew they had to go in to the boxes. But what about a second gift tag sample? What should that be? I really wanted to create something brand new. Weirdly enough, my inspiration came from one of the Bean’s baby shirts. She has an adorable top with different colored cherries all over it, and, (a ha! Light bulb moment!) that was it. Cherry gift tags, it was! Of course, then I had to figure out how to make cherry gift tags. That became a challenge. My first batch of cherries were loaded up with extra embellishments, but looked pretty junky. Cherries are such a simple design, but I was making them way too complicated. 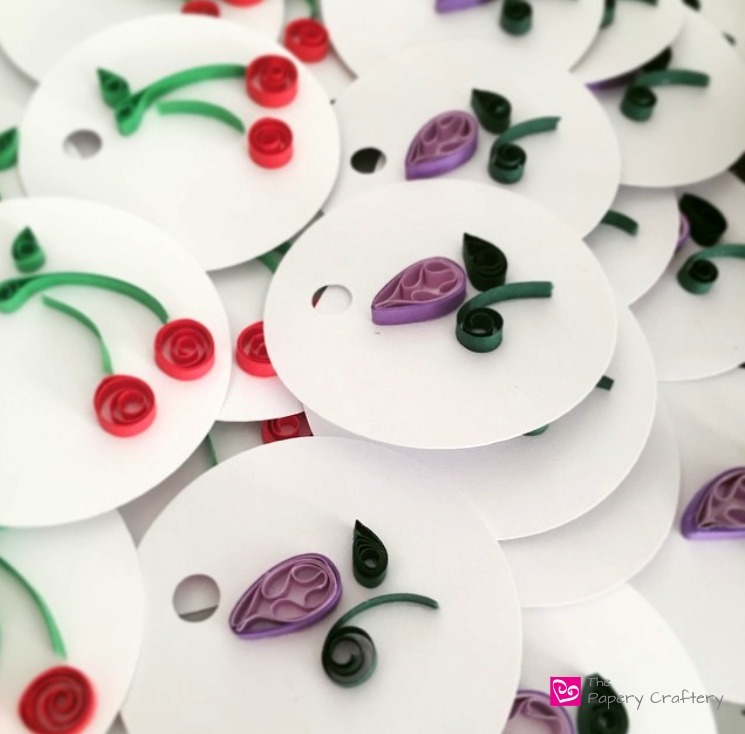 I started over, toned it down, and came up with simple cherry gift tags. After the designs were set, I got to work rolling and gluing, rolling and gluing, rolling and gluing. Add some twine, and voila! Finished quilled paper gift tags. I packaged all my tags in cellophane bags with some of my business cards and a super-secret coupon code for my shop. 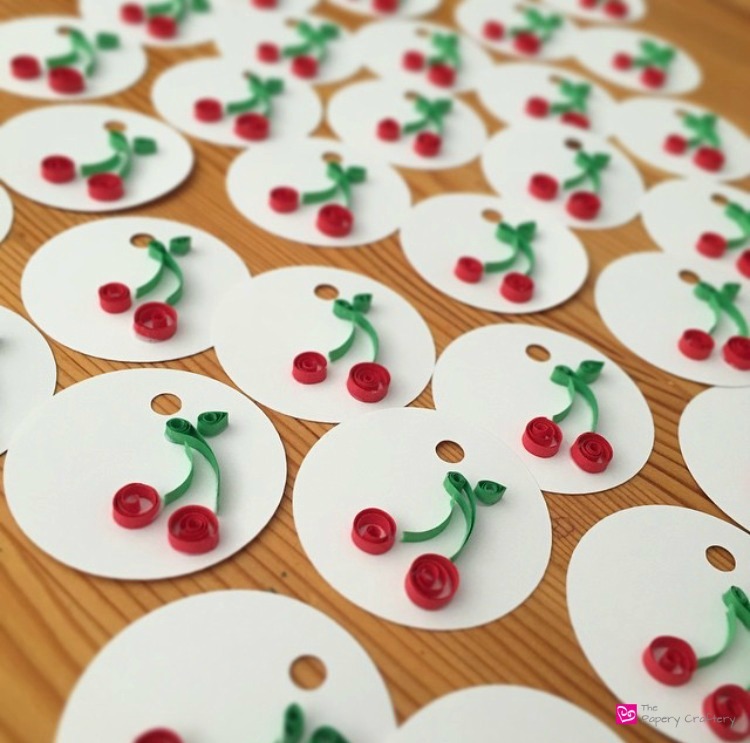 Cherry Gift Tag As Far As The Eye Can See! So now my samples and coupons have been shipped off to The Crafty Mail headquarters. Maybe my shop will get some traffic from this; maybe not. But as a small business owner, sometimes you really have to just put yourself out there and see what works. If it ends up being a big flop for me, ah well. But at the very least, my quilling got in front of 50 people who appreciate handmade crafts and the work that goes into them. Ready for Twine and Packaging! I can’t wait to get my box in the mail and see what samples the other crafty business owners sent in to The Crafty Mail. I’ll definitely update this post then! Update: The box I received from The Crafty Mail was awesome!! So many different and unique products! I was so excited that I signed right up to send out samples for another box. You can get a sneak peak into the Falling Leaves Gift Tags that I sent out for the Harvest themed box in November. Here’s a link to a review of the first box that I had samples in, so you can get an idea of everything that was offered. Have you ever joined in a subscription box service, either as a seller or a buyer? What was your experience like? Leave a comment below!